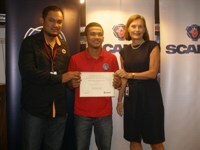 Shah Alam, 25 January 2017 – Scania in collaboration with Kemahiran Belia Negara (IKNB) Kuala Perlis today presented certificates to 12 graduates of the Scania Apprenticeship Programme in the presence of Marie Sjödin Enström, managing director, Scania Sotheast Asia, Muhamed Shukri Bin Abdul Mookmin, deputy director, Mohd Norazwan Bin Ab. Kader – head of automotive department, Mohamad Aswadi bin Mohamad – head of section heavy equipment, IKBN. Kuala Lumpur, 20 January 2017 – Hino Motors Sales (Malaysia) Sdn Bhd (HMSM) today introduced the upgraded Hino 300 series in the presence of Ichirou Hisada, senior marketing officer, Mitsuharu Tabata, general manager, Hino Motors Ltd., Japan, Aqil Ahmad Azizuddin, chairman, Ken Iwamoto, managing director, Dato’ Johnny Chan, executive director, HMSM, Teong Teck Lean, managing director & CEO, GD Express Sdn Bhd, Kenji Tamura, finance director, Hino Motors Manufacturing Malaysia Sdn Bhd and dealers. 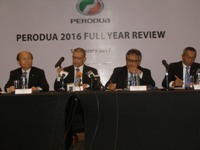 17 January 2017 – Perodua announced today, their performance for 2016 and projection for 2017 during a media Chinese New Year luncheon hosted by Datuk (Dr) Aminar Rashid Salleh, president & CEO, together with other senior Perodua executives. 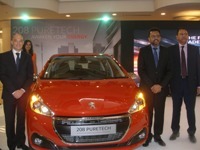 Petaling Jaya, 11 January 2017 – The award-winning Puretech powered Peugeot 208 and 2008 SUV were launched today by Nasim Sdn Bhd, the official distributor for Automobiles Peugeot in Malaysia. 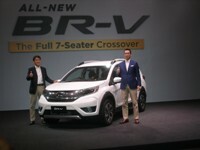 Kuala Lumpur, 5 January 2017 – The much talked about BR-V was launched today by Honda Malaysia in the presence of Noriaki Abe, COO, Regional Operations (Asia and Oceania) of Honda Motor Co., Ltd. and president and CEO, Asian Honda Motor Co., Ltd., Atsushi Arisaka, Large Project Leader, Honda Japan, Katsuto Hayashi, CEO, Honda Malaysia, dealers, associates and the media.